The testo 106 food thermometer is now available as a practical kit with useful accessories including a waterproof case and clip! Waterproof folding thermometer - ideal for spot check measurements in the food sector. For super-fast spot checks and reliable results. 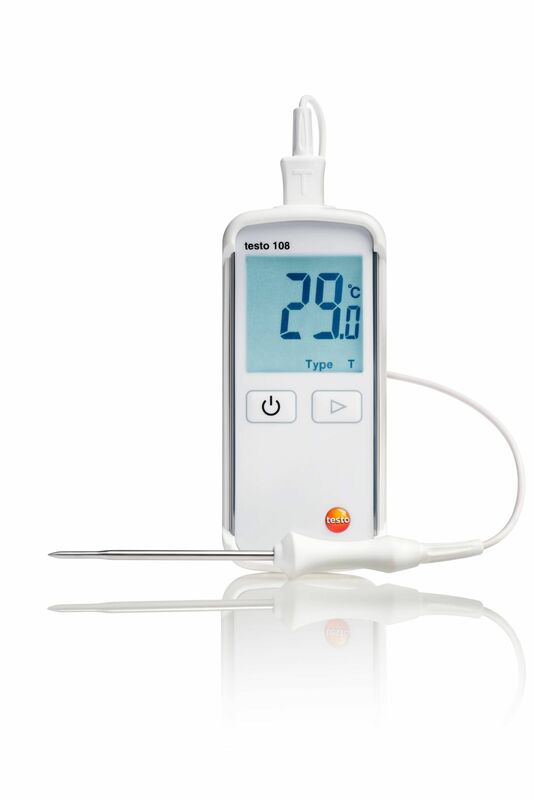 The testo 108 waterproof food thermometer for measuring temperatures during food production, processing and storage. For carrying out super fast and reliable temperature checks during food production, processing and storage. The waterproof mini probe thermometer allows you to measure the air temperature and core temperature of a variety of different media in a variety of different applications. And when you’re done you can either clean your thermometer under running water – or pop it into the dishwasher if necessary. The testo 905-T1 penetration thermometer enables reliable temperature measurements in liquids, soft or powdery substances and in the air. In doing so, it is the temperature measuring instrument's large measuring range and its short response time that make it stand out. Both advantages are due to the high-quality type K thermocouple probe. 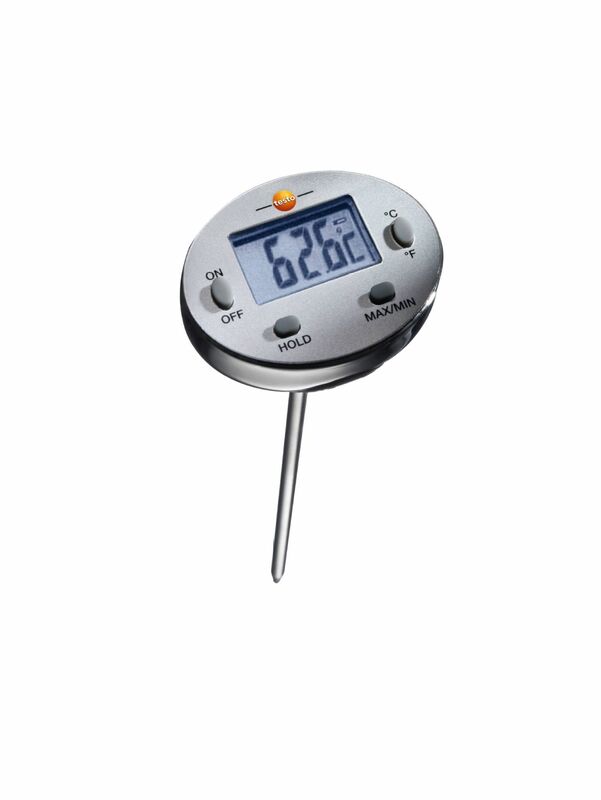 Probe thermometers are used in the food industry to measure the core temperature of semi-solid media like meat and cheese, for example. That’s why they have to be especially rugged and reliable. 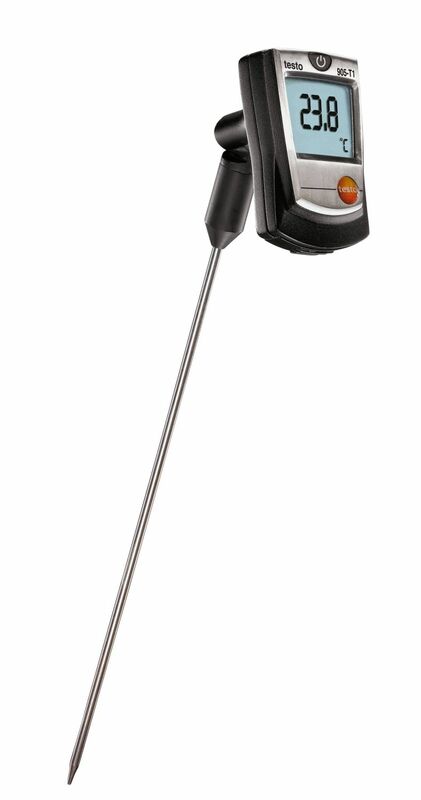 The testo 105 food thermometer is just that. And more. The one-hand thermometer with frozen goods measuring tip enables you to reliably record the core temperature of deep-frozen goods. 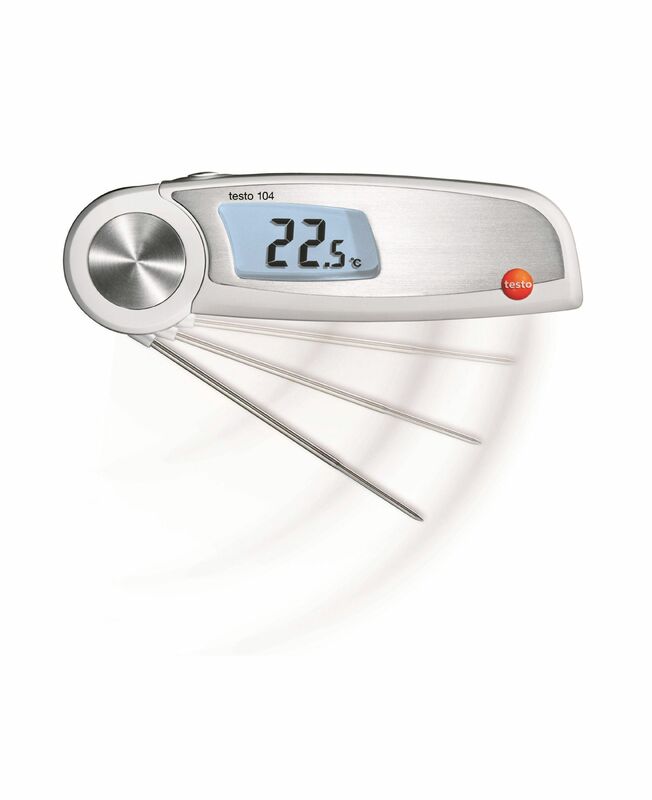 The affordable mini thermometer with min./max. alarm. Small dimensions, big performance: an acoustic signal sounds when the temperature exceeds or falls below the individually adjustable limit values. 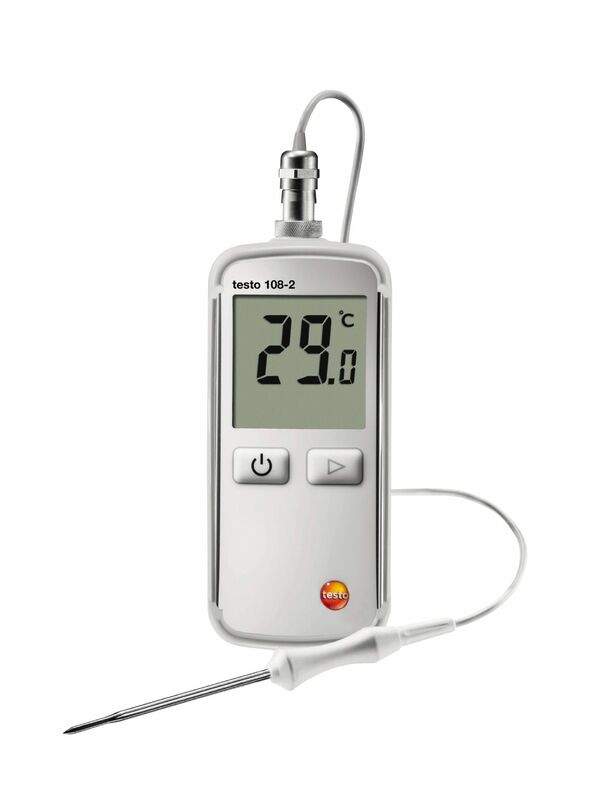 The testo 108-2 temperature measuring instrument can be used for quick spot temperature measurement in the food sector. Compared with the testo 108, the advantage of the testo 108-2 is that the probe can be locked on the temperature measuring instrument, ensuring a secure hold. For spot check measurements in semi-solid goods, in frozen goods and in liquids: make sure you get the testo 105 penetration thermometer in the kit, including standard and frozen goods measuring tip, as well as the long measuring tip. The aluminium case that comes with it enables the items to be securely stored and means they are ready to hand at all times. 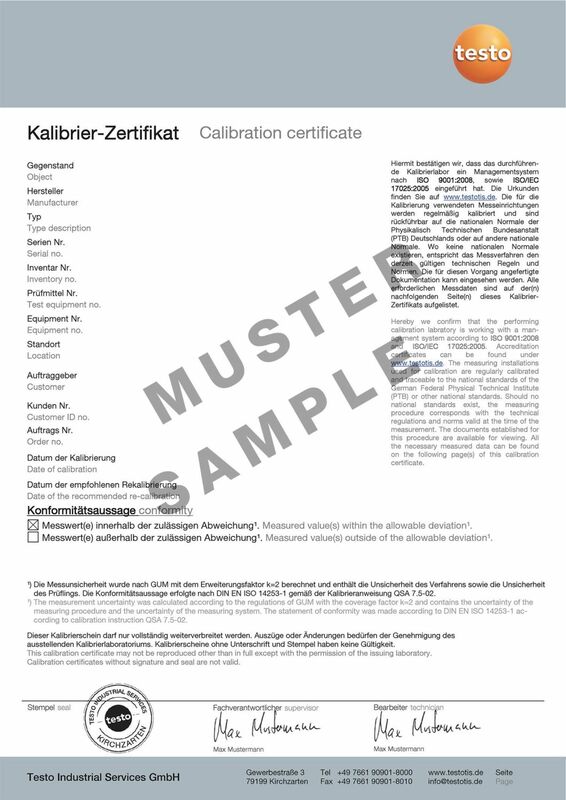 This certificate documents the ISO calibration of your measuring instrument/probe. Calibration is carried out at selectable measuring points within the range 0.5 m/s to 27 m/s.